Turn the player on by pressing the power button. When powered, it should be illuminated green. On the player, hit the eject button and place your disc into the tray; hit the eject button again. The video will start playing automatically. 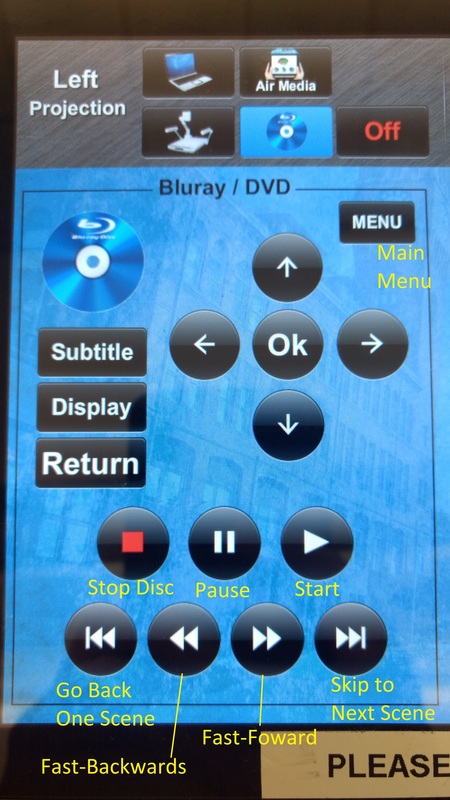 Use the four arrows on the remote to navigate the disc's menu; hit ok to choose your selection. The remote acts as any normal remote. Make sure you point it at the player. Once you are done with the disc, press stop. Then press the eject button to remove the disc. Turn off the Bluray player by pressing the power button. Power on the projector and select the disc icon to show content from the Bluray player. At the bottom right corner of the screen under "Audio Sources", select the disc icon to enable the room's audio. Use the four arrows on the touchscreen control panel to navigate the disc's menu; hit ok to choose your selection. These are some basic functions using the touchscreen panel. 8. Once you are done with the disc, press stop. Then press the eject button to remove the disc. 9. Turn off the Bluray player by pressing the power button.